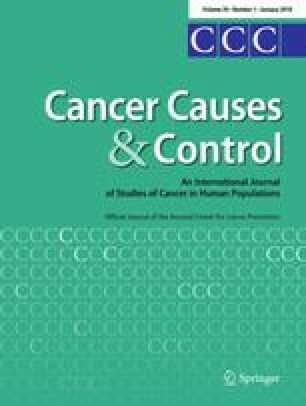 While recreational physical activity (RPA) has been associated with reduced mortality in breast, colorectal, and prostate cancers, evidence for epithelial ovarian cancer (EOC) is limited. Most EOC studies have been in predominantly white populations, although inactivity is more prevalent and survival is poorer among African-American (AA) women. We examined RPA before and after EOC diagnosis and associations with survival among AA women. We analyzed data from 264 EOC survivors enrolled in a population-based, case–control study who completed surveys that included questions about pre- and post-diagnosis RPA. Data were collected on RPA frequency, intensity, and duration before diagnosis and approximately 1 year after the baseline interview. We calculated metabolic equivalent of task (MET)-hours/week for pre- and post-diagnosis RPA, and evaluated associations with risk of mortality using Cox proportional hazards models. RPA before diagnosis was not associated with mortality. Hazard ratios (HRs) for post-diagnosis RPA were < 1.0 but not statistically significant after adjustment for covariates; HRs were 0.94 (95% CI 0.58, 1.54) for > 0–9 MET-hours/week and 0.53 (95% CI 0.21, 1.35) for > 9 MET-hours/week. Our results suggest that RPA may be inversely associated with mortality among AA women with ovarian cancer, although it is possible that the present study was underpowered to detect an association. There is a clear need for more studies of RPA after diagnosis in EOC survivors with attention to potential differences by race. The online version of this article ( https://doi.org/10.1007/s10552-017-0986-8) contains supplementary material, which is available to authorized users. We would like to acknowledge the AACES interviewers, Christine Bard, LaTonda Briggs, Whitney Franz (North Carolina), and Robin Gold (Detroit). We also acknowledge the individuals responsible for facilitating case ascertainment across the ten sites including Christie McCullum-Hill (Alabama); the Metropolitan Detroit Cancer Surveillance System staff (Detroit); Rana Bayakly, Vicki Bennett, Judy Andrews, and Debbie Chambers (Georgia); the Louisiana Tumor Registry; Lisa Paddock and Manisha Narang (New Jersey); Diana Slone, Yingli Wolinsky, Steven Waggoner, Anne Heugel, Nancy Fusco, Kelly Ferguson, Peter Rose, Deb Strater, Taryn Ferber, Donna White, Lynn Borzi, Eric Jenison, Nairmeen Haller, Debbie Thomas, Vivian von Gruenigen, Michele McCarroll, Joyce Neading, John Geisler, Stephanie Smiddy, David Cohn, Michele Vaughan, Luis Vaccarello, Elayna Freese, James Pavelka, Pam Plummer, William Nahhas, Ellen Cato, John Moroney, Mark Wysong, Tonia Combs, Marci Bowling, and Brandon Fletcher, (Ohio); Susan Bolick, Donna Acosta, and Catherine Flanagan (South Carolina); Martin Whiteside (Tennessee) and Georgina Armstrong and the Texas Registry, Cancer Epidemiology and Surveillance Branch, Department of State Health Services. All procedures performed in the studies involving human participants were in accordance with the ethical standards of the institutional and/or national research committee and with the 1964 Helsinki declaration and its later amendments or comparable ethical standards. This article does not contain any studies with animals performed by any of the authors.